Why not try out this mean grain free version of a pancake? High in protein, full of good low GL carbohydrates and tastes amazing. 4. 1 small-medium sweet potato or yam. 1. 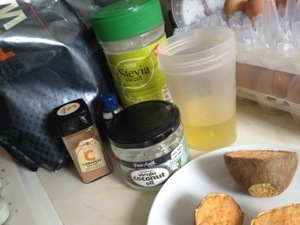 Cook yourself a sweet potato or yam – I used 200g. A couple of minutes in the microwave or about 45-50 minutes baked in an oven.